It is the hatching season for the endangered species of Olive Ridley Turtles. 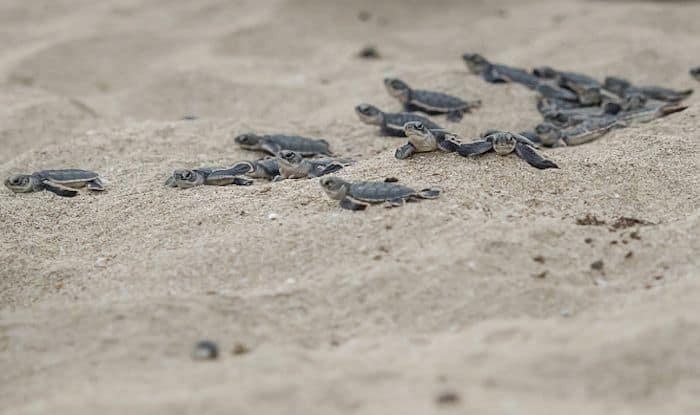 If the idea of watching baby Olive Ridley Turtles hatch out of their shells and take their first step toward the sea excites you, this is the right season for you to witness one. About six hours from Mumbai, Anjarle Beach, nestled on the Konkan Coast near Dapoli, is known for its conservation of the Olive Ridley Turtles. The breeding season starts in November and goes on till March, when the female turtles lay their eggs in conical nests in the sand on the beach. The eggs are then collected by volunteers who keep the eggs protected in enclosed containers for 45-50 days. When the eggs hatch, the baby turtles are brought out to the sea so that they can take their first step toward an independent life. Now, the eggs mostly hatch between March and May, and therefore, this is the best time to head to Anjarle Beach to catch all the action. Remember, you cannot go too near the tiny turtles, nor can you touch them. They’re a rare, endangered species and a little effort of conserving them will stop them from growing extinct. The best time to see the tiny turtles wiggling on the sand is at the break of dawn. Olive Ridley Turtles depend on the sun to guide them towards the sea. They then spend their entire lives in the ocean, feeding on aquatic underwater species. Apart from watching the turtles, you can do a number of other things near Anjarle Beach. A visit to Suvarnadurg Fort by boat is a good idea, and if you’re interested in architecture, the Kadyavarcha Ganpati Temple and other temples dedicated to Vishnu and Shiva are worth a visit. Also, don’t forget to indulge in mouth-watering Konkan cuisine; there’s a great restaurant right on the beach.